Got my grades for this term - I passed everything and all is good. Walked home from graduation rehearsal in torrential rain... thunder and lightning and puddles. Lovely. Watched Kiss Kiss, Bang Bang yesterday. Robert Downey Jr. is still the bestest. Got me a dress for graduation dinner. It's GREEN! Just watched Sylvia on DVD. Now I feel like reading The Bell Jar again. Why do so many geniuses live tortured lives? It's so sad. Anyway. We had our carpets steam cleaned today. They're still damp. Heh. And last but not least, Lem found an earwig and squashed it onto a lightbulb box. You'd think your boohbah infestation would ataleast have taken care of some of that. Note to self: washing carpets brings bugs out of them. Grats on the good grades! hmm... I love your icon... reepicheep is my hero. just wanna pop a hi! hehe! 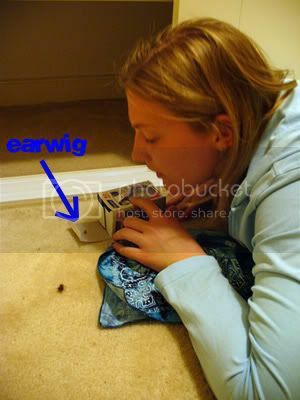 i always thought earwigs are things that comes out of your ear! =P Hehe! MY EXAMS ARE FINALLY OVER!!!! REJOICE!!!!! anyway, that earwig looks, okay, sounds gross! eww. but then again, bugs. they bug (pun intended) you and everyone on this planet. hahah.